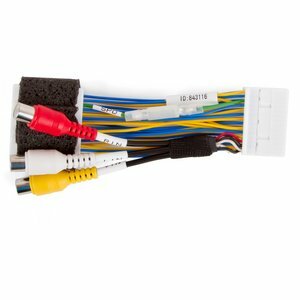 This cable allows you to arrange audio and video input in Toyota Touch 2 / Entune / Link OEM monitors without using the video interface. After the cable connection "AV input" icon is automatically activated in the monitor and video in motion is unlocked. As a result you receive fully functional AV input with possibility to connect composite video signal PAL\NTSC and also linear stereo signal. Thus you will be able to connect the video device, e.g. DVD player, Android box or TV receiver to the OEM monitor without using the video interface. All OEM functions of the monitor will work in the same way as before. Note! In some car models the speed wire (SPD) should be disconnected while driving to be able to display picture from connected sources. However, this may cause problems when using the OEM navigation system. Therefore, this wire should be connected to be able to use OEM navigation. Note! This cable is incompatible with Entune 3.0 system. Note! After this cable connection the OEM microphone of OEM BT-HandsFree will work the same way as before (if it has been installed). if there is no OEM microphone in your car, you will need the AV cable with microphone. Please, contact the manager to purchase that cable (or leave the comments in the order).